Put aside notes, chords, rhythm, and the rest of the composite parts that add up to a song, for none of it means a thing if there's no real story to tell and no true artist to mold and honor the truth in the tale. The late Shirley Horn had an instinctual understanding about that fact, moving beyond the job of mere narrator and entering a higher realm and calling that few ever come close to viewing, to say nothing of touching. She was the story, in body, voice, hands, and soul. As downtempo dramatist she had no equals, allowing emotions to hang on the air. Horn had and understood it all, but she knew not to use it all. She worked in service of the songs, period, and her performances were nothing short of breathtaking. On paper, a Canadian-American male vocalist who doesn't accompany himself on piano isn't exactly the ideal candidate to pay tribute to said legend. But once you hear this, it makes total sense. 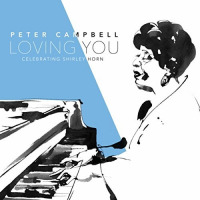 Peter Campbell's supernal singing voice, attention to diction and phrasing, and respect for the meaning of a song are completely in keeping with the way Horn worked. When he sings it, you believe it. This is the kind of album that blocks out the world when you hear it. Maybe he has more in common with Horn than one might think. 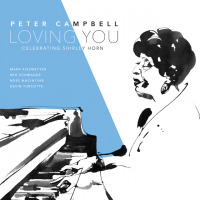 On Loving You, Campbell's empyrean pipes present thirteen numbers that Horn recorded, with an expected emphasis on material laid down during her Verve Records renaissance. The band that joins hima group made up of pianist Mark Kieswetter, guitarist Reg Schwager, bassist Ross MacIntyre, and trumpeter Kevin Turcotteis second to none, sensitively painting one perfect backdrop after another while also adding sophisticated touches in solo and surrounding stands. Turcotte's midnight mute work and open-horned warmth serve as a perfect brass parallel to Campbell's light-toned, emotion-rich vocals; Kieswetter and MacIntyre are pure class, laying down exactly what's needed to support singer and song; and Schwager's guitar is pleasant poetry in motion, bringing rhythmic clarity and grace to the music. You don't miss a drummer here, and that says volumes about how this group carries itself. This entire program is absolutely stunning, holding attention from the first notes of an emotionally complex "A Time For Love" to the last of a bossa-based "You Won't Forget Me." In between there's an azure-teal blended "Sharing The Night With The Blues," an exposed "Loving You," a resigned yet breezy "There's No You," a haunting "Wild Is The Wind," a scenic stroll through "The Great City," and a half dozen other winners. There's simply nothing not to love on Loving You, so listen closely and drink it in. Here's to life, the late Shirley Horn, and the incredibly present Peter Campbell. Track Listing: A Time For Love; Sharing The Night With The Blues; Loving You; There's No You; Wild Is The Wind; Forget Me; I Watch You Sleep; The Great City; The Sun Died; If You Love Me; Something Happens To Me; So I Love You; You Won't Forget Me. Personnel: Peter Campbell: vocals; Mark Kieswetter: piano; Reg Schwager: electric guitar, acoustic guitar; Ross Macintyre: double bass; Kevin Turcotte: trumpet.